Dexter Daily: Scott Buck Dishes on the Shocking Series Finale of Dexter: "We Considered Every Option"
Scott Buck Dishes on the Shocking Series Finale of Dexter: "We Considered Every Option"
WARNING. Dexter Series Finale spoilers ahead. if you haven't seen the final episode, please stop reading. via THR: It's over. Showtime's serial killer drama Dexter, the series that helped put the cable network on the map with original programming, ended its run Sunday with an episode that featured a major character's death and final moment that likely will be debated for years to come. Written by showrunner Scott Buck, the series finale featured an intensity greater than anything this season as Dexter and Hannah played an epic game of cat and mouse with Elway and Deb fighting for her life as her brother pursued Saxon. Ultimately, Deb's gunshot wound proved to be too much and after complications from surgery, Dexter had to make his most emotional kill yet when he opted to unplug the ventilator and mutter his final words to her: "I love you." After a somber Dexter sheds his first tears and deposits Deb's body into the ocean, he steers his boat into the hurricane, setting the stage for what appeared to be a suicide. But that would not be the end for Dexter. After two flash-forwards, the serial killer decided that he would be the one to pay the price for Deb's death and protect Hannah and Harrison (Luke Andrew Kruntchevin) in the process, faking his own death and starting a new life. The Hollywood Reporter turned to Buck to explain the final scene(s), why Deb had to die and why Miami Metro would never know about Dex's Dark Passenger. Read the interview after the jump, and beware of finale spoilers! What is the look on Dexter's face at the very end of the series? Is he attempting to fight the urge to feed his Dark Passenger? What's the takeaway? We wanted to leave it all in the viewers' head. I don't know what he's thinking in that moment; I know he's in this self-imposed prison and the reason he locked eyes is essentially so we can feel as uncomfortable as he does in his world. He's someone who was just moments from taking that final step toward humanity who then has to face himself as the monster he believes he is and decide his own fate. He gives himself what he deserves. I don't think in that moment he's fighting the urge to kill; he's dealing with the reality of the misery of his life in that moment. At the same time, he's also feeling his feelings, which is progress for him. It is, but he wishes he wasn't feeling anything at all. It's the curse of his journey toward humanity, which now is having to feel what he feels. He purposely took that journey toward becoming more human and is now suffering the consequences. Was there ever a point where you considered Dexter taking his own life and ending the finale after Hannah learns of Dexter's death? We considered every option for the finale. But I don't think Dexter killing himself was one I ever took seriously. Dexter's survival instincts are so strong that that would always be a last option for him. Did you talk about ending the series after Angel learns that Dexter died and not seeing either time jump? No, I always pitched it as a whole; it was always the sequence of those scenes. We see Dexter disappear into the storm, we find wreckage, Batista (David Zayas) learns of it, then Hannah learns of it, then there's a slow fade to black and coming to the reality that Dexter, who has always been able to survive everything, is once again still out there. Was it always Dexter's plan to survive after he sailed into the hurricane? He knows exactly what he's doing there; he's putting his boat in the path of the hurricane, which will then allow him to escape in this way. It is mentioned in an earlier episode that he does have an emergency life raft aboard that boat and you can look back and see he had a plan, he just didn't know what it was. As Dexter is poised to deposit Deb's body into the ocean, it felt like he was considering jumping in with her. Was that ever on the table? It's also the first time you ever see Dexter cry. Dexter killing himself never felt quite believable to me. It's a worse sentence in a way to have to live with what he's done and killing himself might have seemed too easy a way out. Is it possible that that thought crossed his mind? Absolutely. It's so much darker and more horrible for him to have to live with what he's done. He's absolutely punishing himself at the end by having to deal with what he's done. What behind the decision to have Dexter ultimately be the one to take Deb's life? The last couple seasons have been about breaking down the walls inside Dexter's head -- through having a son, through his relationship with Hannah and Debra -- and discovering who he is. But even then he was somehow able to justify what he did and was still going out and killing people. It took the death of Deb -- the one person he's cared about in his whole life -- to force him to fully open his eyes. Once he does, he really seems to have very few options. It always felt important to me that whatever happens to Dexter, the end of the series wasn't about something that's happening to him but rather that it's his decision. He has decided the fate of so many other people, but now it's up to him to have to decide his own fate. His decision is to remove himself from the thing he's always wanted the most -- which is to be connected to humanity -- and to live in this self-imposed prison in the land of the serial killers: the Pacific Northwest. He also couldn't allow her to live under those circumstances. There's no hope of recovery for her and he knows she wouldn't want to go on this way. Dexter has killed so many people so easily throughout his whole life -- and it's the easiest thing in the world for him -- but to have to end his sister's life is the most difficult thing he has ever had to do. 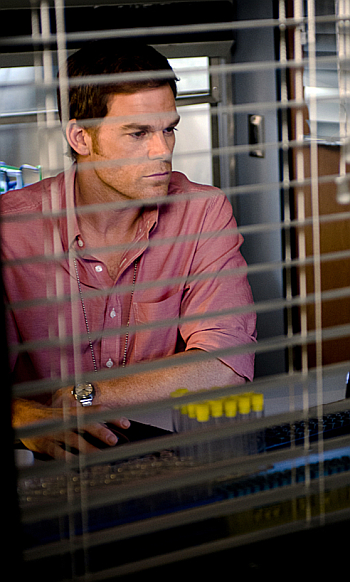 Dexter leaves Harrison with Hannah, who herself is a serial killer. Why? He doesn't judge Hannah the same way that we do because he understands what it means to kill. He's fully aware that Hannah is not the same kind of killer he is. She doesn't kill out of a need or a lust, she kills simply out of self-protection. He believes Hannah loves Harrison and would do anything to protect him. In some ways, it's almost the fact that because she is a killer that makes her more worthy of protecting his son. David Nevins said he's looking at all avenues for a Dexter spinoff. Is Hannah and Harrison's story something you've talked about for a spinoff? Absolutely. I love Yvonne Strahovski, she's a terrific actor and has brought so much to the series. Who knows? We may see her again in the future. Why was it important to include flashbacks to Deb and Dexter seeing Harrison for the first time? We wanted the flashbacks to document the moment when we felt that there was genuine hope in Dexter's future. Dexter's life really took a turn when Harrison was born; that was the moment when he started seriously wanting to be something better and wondered if there were more possibilities. It's flashing back to a very hopeful and positive moment in his life and to realize that even then he was fooling himself. Did you ever consider having anyone find out about Dexter's Dark Passenger? Sure. We talked about it. There were possibilities of having it come up, but it felt like bringing that up in the finale would have crowded too many things in there that ultimately wouldn't have a necessarily positive affect on the episode. It could have been anyone. We talked about Batista suddenly discovering something like that at the last moment, but it felt like it would take the episode off in a different direction and take the focus off of what Dexter's emotional journey was. After Quinn (Desmond Harrington) sees how Dexter kills Saxon with a pen so swiftly, calmly and effectively, they exchange a look. What was behind that? It felt as if it solidified Quinn's old suspicions of Dexter. Quinn has never believed or thought that Dexter was a serial killer; he always thought there was something off and a little dangerous about this guy. He spent one whole season looking into him. Quinn believes Dexter is not the nice, easygoing guy everyone thinks he is but I don't think there's a thought inside his head that he could possibly be a serial killer. There's darkness in Dexter the same way there's darkness in Quinn. That sounds like good fodder for a spinoff. Yes. Quinn wishes he were the one who could have killed Saxon. He believes Dexter killed Saxon on purpose and he may have set it up someway but that's as far as it goes. In [Quinn's] mind, that's perfectly justified and he'll do what ever it takes to protect [Dexter]. A lot of viewers have not been pleased with this final season. Are you proud of the final run? What would you have done differently? I've also heard that some viewers are not happy with this season, and they all have different reason for it. So much of the stuff you read is that people want the show to be like it was the first few years where Dexter would go out and kill people. If we had continued to follow that line, the show would have gotten old very fast. This is a show that's run for eight years, and in order to sustain interest you have to continue to grow and evolve. So yes, I am happy with where we ended the show. This is absolutely the ending I wanted. This season introduced a lot of plot points that didn't go anywhere: Masuka's daughter, Quinn vying for sergeant. Was all that just closure? We've spent eight years with these characters and we want some feeling of where their lives are going to go. With Masuka and his daughter, it was meant to be a simple nod to the fact that Masuka hasn't been the most sexless character we've ever seen on the show and the irony that the one satisfying relationship with a woman that he would finally have would be with his daughter. It was really just attempting to give closure to a lot of our characters. Where are you with the spinoff? Do you have an idea? There have been no discussions yet on what a spinoff might be. Whether there is some other version coming out of the show in the future, it's always a possibility but there have been no talks about it at this point. We're just now finishing up Dexter. What was your final moment with the cast during production like? The very last scene we shot was the location stuff in Oregon, so the only actor with us was Michael. He's someone I've worked with for seven years on this and five on Six Feet Under. He has been a huge part of my writing career. As we were shooting that very last shot, I realized it was the last scene I was going to shoot with Michael. It was really emotional for me. He's been a tremendous actor to work with for so many years and this show for me has been a great experience.